Kids can now write on the walls with your blessing! How? 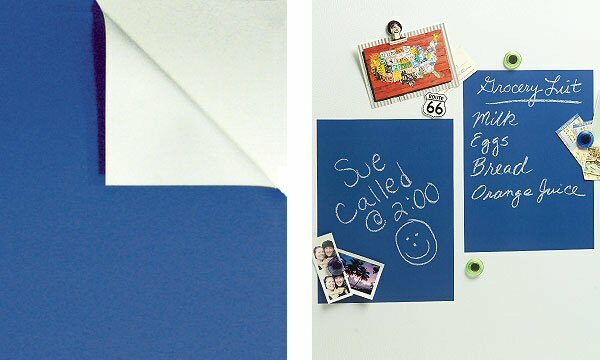 Simply peel and stick these Blueprint Blue vinyl chalkboard wall decals to any dry, clean, smooth surface, and presto! Instant writing surface! Removable and repositionable, these Blueprint Blue peel and stick chalkboards can be used individually for four 9" x 12" panels, or aligned-and-combined for a large canvas, just awaiting your budding artist. Wallies Blueprint Blue chalkboard wall decals are perfect for messages, chore lists, school schedules, and more. Just imagine the possibilities! Note: Chalkboard is not magnetic. Each sheet measures 9" x 12"